Versatility and Compatability: Our rowing rigs, sail kits, and accessories can share components. The crossbar in our sail kit or stabilizer works with our rowing outriggers. The sail kit steering oar is the same as our flat-blade rowing oar. The rowing rigs accept our stabilizer floats, portage wheels, or leeboards. 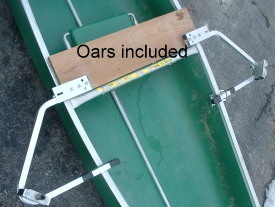 Portability and Ease of use: Oars snap apart in the middle for greater portability. 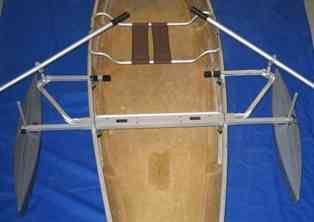 Rowing outriggers snap in and out of crossbar and clamp to canoe gunwales. Crossbar, seat, mirrors, wheels -- all are easy on, easy off, requiring no tools. Benefits: Rowing is great exercise and is faster than paddling. Rowing enhances control, especially when solo. This package works with your canoe seats. 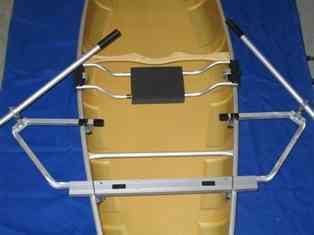 Our adjustable rowing outriggers let you adjust the rowing span to your preference! 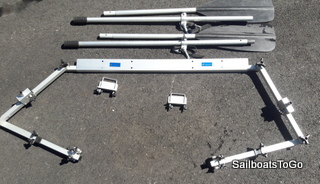 Includes crossbar, rowing outriggers, oars, oarpins and clamps. No tools needed. Easy-on/off attaching with clamps provided. Crossbar also can accept wheels, and stabilizers. Click links to see prices. Low center of gravity, adjustable width, foam cushion, and strong! 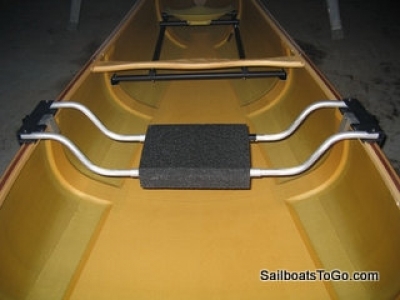 You can also connect portage wheels, stabilizer pontoon outriggers, or leeboards along with the rowing outriggers. Low center of gravity for stability, completely no-tool installation and padded seat. 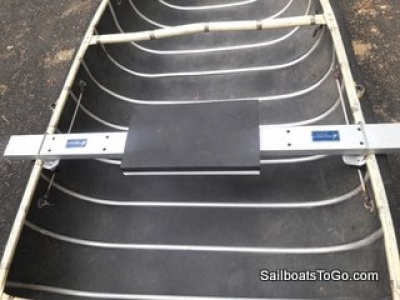 Includes crossbar, gunwale clamps, adjustable rowing outriggers, oarpins, and oars. Includes the Base Rowing Package plus this clamp-on drop-in seat. Same as above but with fixed-span (non-adjustable) rowing outriggers. The adjustable ones are plenty rugged for most rowers, but if you want the strongest and most durable rowing gear, get this package. It costs a bit more and doesn't offer quite the convenience of the adjustable outriggers, but it's more durable. This is a DIY option. It includes rowing outriggers and oars and sockets for the rowing outriggers. You buy a 1 x 10 board and bolts and bolt the sockets to the board. The board is also your seat. 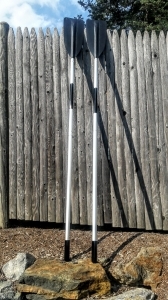 Includes our non-adjustable rowing outriggers as shown . Lets you connect portage wheels, rowing outriggers, stabilizer pontoon outriggers, or leeboards directly into its side pieces. In addition it is a lowered seat for low center of gravity. Adjustable width. Foam Cushion. Strong. 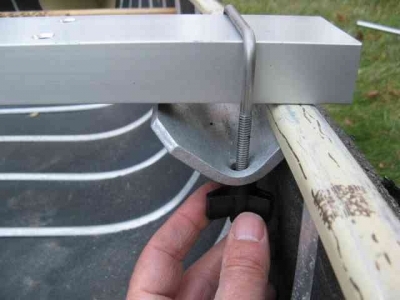 Clamps to the gunwales of your canoe to let you easily slide from side to side! 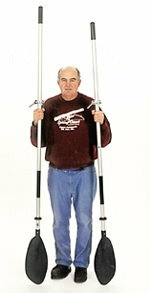 Telescopes from 32 to 38 inches to fit most canoes. Seat is made of durable, comfy ethafoam. Doubles as a Yoke for carrying your canoe! Go faster, exercise legs, enjoy the addictive smooth rhythmic feeling of sliding-seat rowing. Using your leg muscles you move your whole body back and forth to help power the oars and extend the length of the oar stroke. Sits on floor of your canoe. Requires about 4 feet of open space on floor of your canoe. Base is wood over a stiff, non-crumbly, non-squeaky, non-skid foam. So you just plunk it in the bottom of your canoe and go. Watch Video of sliding seat in action. Stabilizer floats help prevent capsizing. The hard plastic floats are very streamlined for low drag and low splash. They adjust up and down, and in and out, with no tools and simply slide into the crossbar of the rowing rig. Kayak-shaped pontoons on each side. Shown in Gray, can also be red, yellow. blue, or mango. Slip off your rowing outriggers and slip on these wheels. They attach to the same crossbar used with the rowing rig or the Accessory Seat. Makes your canoe portable on land. 16" wheels are heavy duty, like a contractor's wheelbarrow tire, for easy rolling on rough or soft ground. Lightweight 12" wheels are more compact and lower cost. 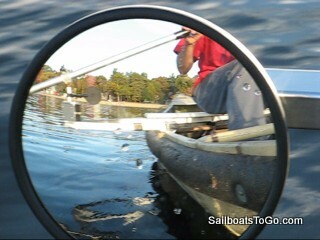 See where you're going when you're rowing with this large round convex adjustable mirror on ball & socket joint. Stainless steel back and unbreakable mirror surface. 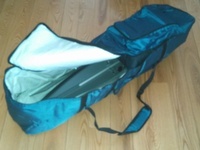 Same as our sail kit bag, but also great for rowing rig, even with pontoons, with room to spare. Strong fabric and strong zipper. Color may be different. 12 x 12 x 48 inches. Gets your oar pivot points farther apart than width of the canoe, for better leverage when rowing. Requires crossbar and gunwale clamps from our canoe stabilizer or canoe sail kit, or can plug into our Accessory Seat. These outriggers arms also get your oar pivot points farther apart, but aren't adjustable. Non adjustrable Rowing Outriggers shown with complete Drop-in Seat Rowing Rig. Heavy Duty Flat Blade Oars Not only Stronger but also they convert into a kayak paddle. If you want to vary your activity, you can stop rowing and start paddling with an 8-ft double-blade paddle made by snapping together the two blade sections of these oars. Clamp-on oarlock for 1 1/8" to 1 1/4" oar shafts. For clamping crossbars to your canoe. Aluminum crossbar with two square tubes in it that accept our stabilizer float arms, pop-in leeboard mounts, and/or rowing outriggers. Pre-drilled for the spring-buttons that lock in the attachments. Co-owners Jim Luckett and Rob Michael are passionate about extremely portable inflatable sailboat sailing. If you need assistance shopping, sailing advice, or have a boat not listed on our site, call or email us!